"How to be Miserable" is a new series here on Family Volley. 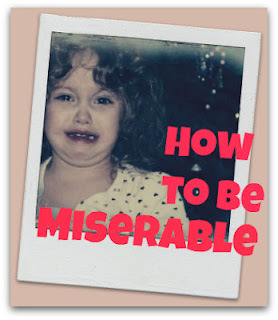 Each week I will post one way to be Miserable. To help us remember how to be Happy. Miserable people put themselves down. You can't give them a compliment because they won't accept it. You tell them dinner tasted great, they say "no it was too dry." You tell them they look nice, they say "I think I would look better in different pants". And they are always quick to point out their faults. Most of the faults they point out, you wouldn't have ever noticed until they pointed them out to you. You get tired of saying kind things to them because they are always denying their worth. Being around them is tiring because no matter what you say, they won't accept it. Yep, if you wan't to be miserable, put yourself down and deny your worth. It's a great way to ward off good friends. Happy people don't put themselves down. They understand they are not perfect, but they accept themselves and understand that their worth is tied to more than their pant size and the perfect meal. Remember, "You is kind, you is smart, you is important." Challenge: The next time you want to "refute" a compliment, bite your tongue and say thank you instead. Do you have a hard time accepting compliments? I'm working on accepting compliments. Every time my husband says something nice to me I say "You are." or "you do" or whatever, and it's starting to seem weird. So I've started saying "Thank you!" to every compliment I receive. It feels weird at first, but after a while, it's kind of liberating. Amazing so many people can't take a compliment (myself included). Still, it goes better along the way. Took a long time to realize I need to see myself through God's eyes. I find who He say's I am to be most satisfying. I try to fit myself into 'acceptable, socially normal boxes' and with Him I can take a compliment now AND actually believe it. You can say Thank you easily and not truly accept what was said by the other imperfect human...but God won't lie. Although His truth is hard to swallow at times also. It's still reliable. Oh my! that good to find a blog like this! with that family atmosphere, good things, good conversation, I sign up immediately!